Just as Gene reached for the phone to call Eileen, it rang. He picked up with his usual "Morning, Gene Phillips." It was Eileen. "Gene, got a minute? I want to update you on Marigold." "Sure," he replied, "come by." As he hung up, he marveled at how often this happens — you reach for the phone to call people just as they call you. This time he thought he could explain the coincidence. Marigold was in crisis, and it weighed heavily on them both. A minute later, she popped in, closed the door, and sat down at his conference table. He rolled his chair over to join her. "So. Tell me," he said. "It's about what we expected," she began. "Bellamy can't make the slipped date, so it's Plan C — Plan B is dead." This was news to Gene. "Plan C?" "There isn't one yet. We get to work it out." "Typical," he said. They talked for a time about options, but none seemed especially wonderful. Then Eileen's pager went off — she was late for a meeting. So they decided to let it go for now, and talk tomorrow. feeling trappedEileen stood up to leave, stepped to the door, and grasped the knob. "Oh, and I'm thinking of moving on. I've got an offer and it's too good to pass." What Eileen did is known as a "doorknob disclosure" or "bye-bye bombshell" — an uncomfortable, painful, or embarrassing revelation offered at the end of a meeting or conversation, usually by someone who's about to exit. Organizations also engage in doorknob disclosures. An outstanding example is the Friday layoff. When we learn about bad news in this way, we can feel frustrated and trapped, and sometimes angry, but if we recognize a doorknob disclosure as it's happening we can make more useful choices. 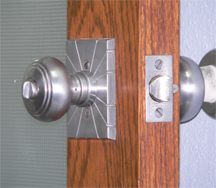 Here are three tips for dealing with doorknob disclosures. Perhaps the motivation for the doorknob ploy is fear or embarrassment. Explore this. You're more likely to make a constructive connection with the discloser after you first work to calm the fear. The doorknob ploy is disrespectful, because it limits your ability to respond. Work first towards mutual respect, rather than addressing the disclosure itself. If the discloser has greater organizational power than you do, think carefully. Even if you get around the doorknob, the discloser might use more heavy-handed techniques to limit your freedom. Because the doorknob ploy imposes a time constraint, it adds stress, making a good outcome unlikely if you try to deal with it immediately. Ask, "When would you like to talk about this?" Would you like to see your comments posted here? rbrenwFXzNjNvUVPLJnAFner@ChacptWWVRzYBaZKdhHroCanyon.comSend me your comments by email, or by Web form. I offer email and telephone coaching at both corporate and individual rates. Contact Rick for details at rbrenjVjxQohRRKCJTicVner@ChaccRHtCwIrjVIpjSJLoCanyon.com or (650) 787-6475, or toll-free in the continental US at (866) 378-5470.